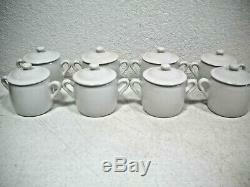 For sale is a set of 8 white porcelain covered'pots du creme' by Pillivuyt France and each is marked as such. 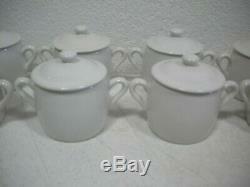 They are 2 1/2" tall to the top of the rim, 2 3/4" tall overall counting the knob on the lid. The body is 2 3/4" wide, 4 1/2" wide counting both handles. All 8 sets are in great, pre-owned condition with no chips or cracks present. One of the lids has a small rough area on the outer edge only. Hard to find additions to your collection! The item "Pillivuyt France White Porcleain Custard / Pots de Creme Set of 8" is in sale since Saturday, February 23, 2019. This item is in the category "Pottery & Glass\Pottery & China\Art Pottery\European Pottery\French". The seller is "buysareus" and is located in Tucson, Arizona.